Multiple-Award Winning Author, Victorine Mbong Shu and 12-Year-Old Stacey Fru, International Award-Winning Bestselling Author. This Mother and Daughter are both Activists, Philanthropists, Educators and BrandSA Ambassadors with special focus on literacy and motivational talks. Stacey Fru is the youngest South African Multiple Award Winning Author of Chapter Books who wrote her 1st book, ‘Smelly Cats’ without her parents’ knowledge at the age of 7. 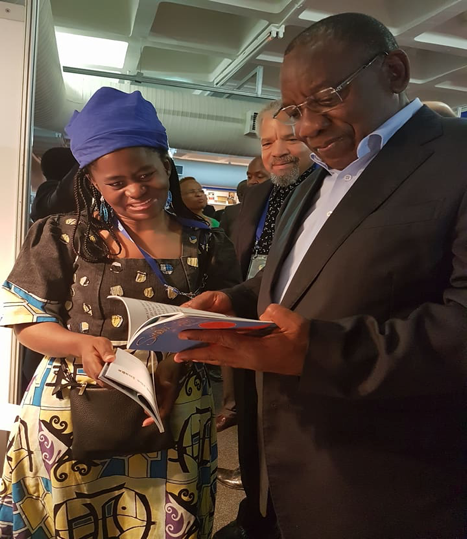 This book was approved by the South African Department of Basic Education as suitable for young learners from Early Childhood through to Primary School. She is a fun-loving and bubbly young girl born on the 16th of February 2007 in Johannesburg as the 2nd of 4 children. ‘Smelly Cats’ won 3 awards before Stacey’s 2nd book ‘Bob and the Snake’ was published. Stacey’s Awards and Recognitions include; ‘Smelly Cats’ as the 2016 NDA ‘Best ECD Publication 2015: Special Mention Category’, prize donated by UNICEF, ‘Young Leader 2016’ for her leading motivational and inspirational roles, and ‘Academic Achievements and Initiatives 2016’ for her writings at the East Wave Radio Nelson Mandela International Community Day Leadership Award. Mail and Guardian Top 200 Young Most Influential South African 2016, a Runner up at the Vita Basadi Awards in the “Young Dignitary Category for 2017,” and a finalist for the “Gauteng Premier’s Women of Excellence Awards 2018” in The Girl Child Category. Stacey won in the Category of Skills Development and Education in the “Gauteng Premier’s 2nd Youth Excellence in Service Awards 2018;” an emotional occasion in which Premier, Hon. David Makhura announced her as a Special Guest, gave her an open ovation and lifted her to the crowd. She is winner of the 2018 Fountain Category of the IBHUKU Inaugural Awards. 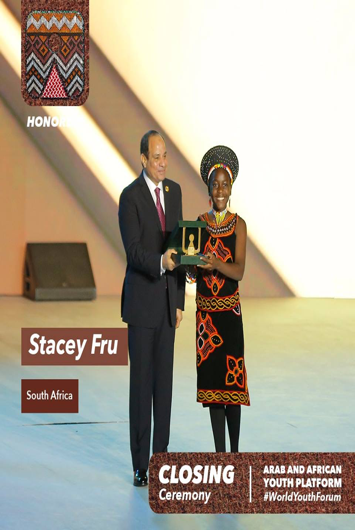 Stacey was the Winner at the Vita Basadi Awards in the “Young Dignitary Category for 2018.” She was Recognised as 5 Most Promising African Youth in 2019 by the Egyptian President HE Abdelfettah El Sis in March 2019. Stacey was the youngest founding member of the Wits University Centre for Multilingual Education and Literacy in 2016. Her 3rd book “Smelly Cats on Vacation” was launched on the same day as her education foundation – The Stacey Fru Foundation, through which she empowers others. She is a Save the Children and BrandSA Play-Your-Part Ambassador. Victorine Mbong Shu is a mother of 4 children and a wife. She is BrandSA Play-Your-Part Ambassador, a Businesswoman, who has been in education and training since 2002 as CEO of Profounder Intelligence Management Services, a Publisher, Editor, Researcher, Transformational Speaker, Mentor, Material Developer, Facilitator, Assessor, Moderator and TV Talk Show Host at Children Television South Africa (CTVSA). She and Emmanuel own and manage the Profound Conference Centre in Bramley-JHB. Victorine is a selfless community builder and a philanthropist by nature. As mother of the world’s youngest international multiple award-winning bestselling author of Chapter Books and the Custodian of the AfrICAN Children of the Year Awards, Stacey Fru, Victorine is passionate for emancipation of families, focusing on women and children. She boosts good leadership and people management skills and remains passionate and enthusiastic in everything she does. Her management style is management by consultation and cooperation and she prefers working in an open, progressive and goal oriented environment. Victorine studied for a Master’s Degree at the University of Johannesburg. She is an Involved Parenting Conversationalist.